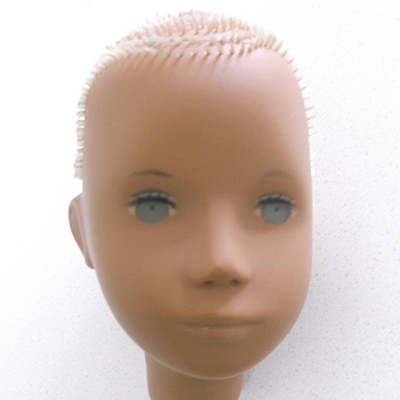 Most Sasha Doll Re-Rooting projects I take on are usually because of hair loss or due to budding little hairdressers (like my younger self) who have chopped off more then they had bargained for. But whichever way they come to me, their owners and I begin with the question of whether to restore the hair back to its former glory or go for a totally new style and color, unique to their doll. 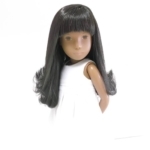 Every Sasha Doll has its own fingerprint, from the amount of roots and hairline formation to the skin tone, face shape and features. So to begin the Sasha Doll Re-Rooting, I examine all these factors before suggesting what would suit him or her the best. To start the Sasha Doll Re-Rooting process, each of the Sasha Dolls need to be taken apart. Because of this, I can also give the limbs and body a full spa treatment and repair the cords if need be. Then the Sasha Doll Re-Rooting takes at least 4-5 days, followed by a final day of styling. I use a high quality fiber called kanekalon where my supplier stocks hundreds of shades to choose from, so nearly always a particular shade can be sought. It has taken several years of Sasha Doll Re-Rooting and understanding to know how to handle the kanekalon. Even though I use the glossy long, straight hair, all manners of curls can be permanently set to the desired finish. 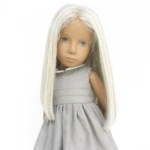 Once the Sasha Doll Re-Rooting work is all done, several photographs are taken of the finished result to show the owner and if anything needs adjusting, it can be dealt with at this stage. Finally, before the Sasha is returned, I give Sasha Doll Re-Rooting one final wash, check around the cut so it falls perfectly and box up the beauty to send home.